Futuristic, avant garde and potentially divisive, Opera Australia’s new production of A Masked Ball is nothing short of spectacular in scale, making epic use of the State Theatre stage. Add in beautiful singing and solid acting and you have an evening of thought provoking, if somewhat unsettling, entertainment. The bicentenary of Verdi’s birth is well represented in Melbourne with two of the three presentations by Opera Australia this year. Wagner’s bicentenary, of course, is to be celebrated in grand style with the highly anticipated premiere of the brand new Ring Cycle. 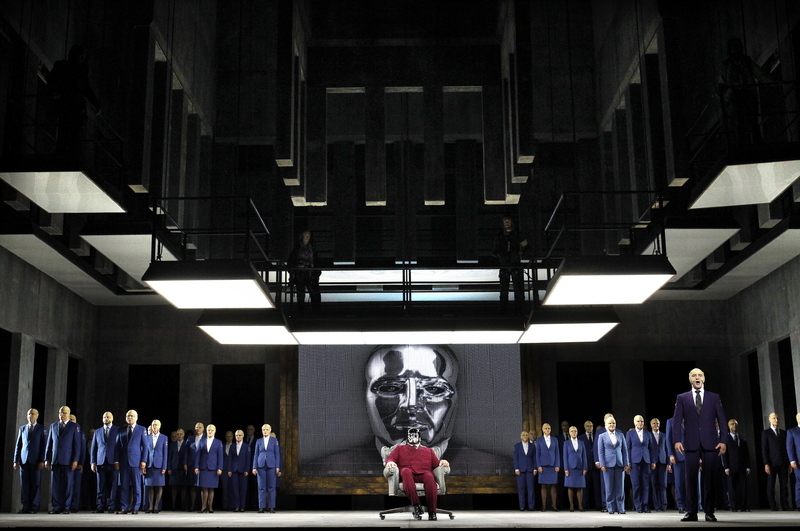 Alex Ollé of Barcelona’s La Fura dels Baus has imagined the politically charged opera as taking place in an Orwellian future. The visual vocabulary and societal hierarchies that must be absorbed by the audience here are usually reserved for the medium of film. To that end, a filmed sequence is projected during the overture, establishing elements of androgyny, industrialism and inequity of world resources. We enter the world of a dystopian society in which all people have their code number embroidered on the back of their blue suit and all wear masks. The subversive underbelly is glimpsed in the visit to prophet Ulrica’s den, in which dissidents display banners calling an end to masks. Gustav is still portrayed as a popular king, but his government is crushing the people, an arc that comes to a deadly end for all in the re-imagined climax of the story. 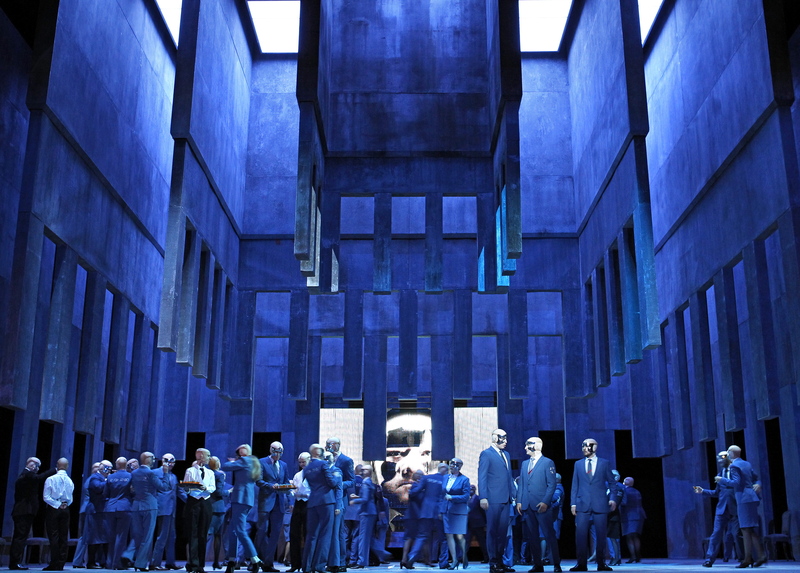 The gigantic set design of Alfons Flores, a frequent collaborator of Ollé’s, makes incredible use of the stage, possibly the best use ever seen in terms of a production that is designed for both the Joan Sutherland and State Theatre stages. No black masking here, the massive spaces extend all the way to the wings and impossibly high into the fly tower. Vast concrete panels rise and fall to create broad or intimate zones, with industrial overhead lighting panels adding to the atmosphere that is also enhanced by ongoing projections. The various configurations of the staging create fascinating visual images, and even with the high number of possibilities explored throughout the night, it still left one wanting to see more. Lighting, by Urs Schönebaum, is a significant factor in the variety of images achieved, making excellent use of the vast sheer surfaces. Costumes by Lluc Castells, another colleague of Ollé’s, serve the concept but not manage the grand appeal of the scenic design. One can only imagine the reaction of the singers when first told they had to wear the restrictive masks. Aural and vocal concerns have presumably been ironed out but the problem which remains lies in identification of the performers. The facial coverage also causes significant limitations in the performers’ ability to transfer facial expression to the audience, which is surely a key aspect of live performance. 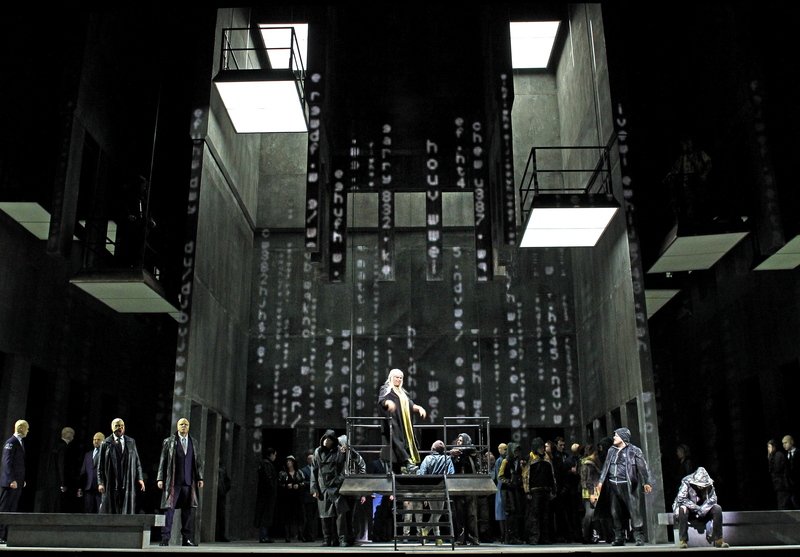 It is entirely possible that the overall concept could have been achieved without the masks, which seem, at best, a far too literal play on the title of the opera. 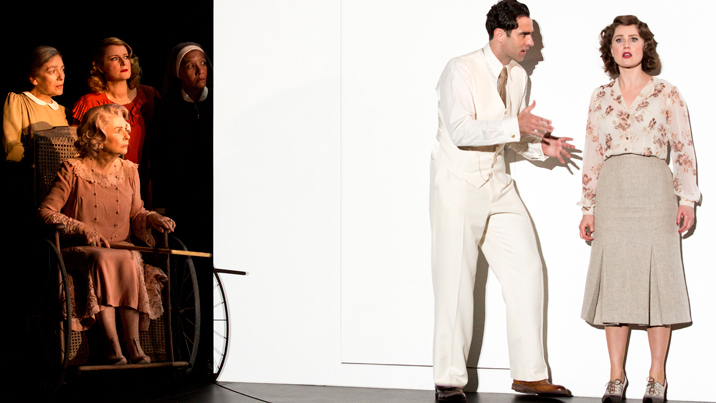 Baritone José Carbó makes an auspicious Verdi debut, singing the role of Count Ankarström with characteristic beauty. The mask potentially aided Carbó’s portrayal of the villainous Count as it dampened his playful smile and the natural sparkle in his eye. 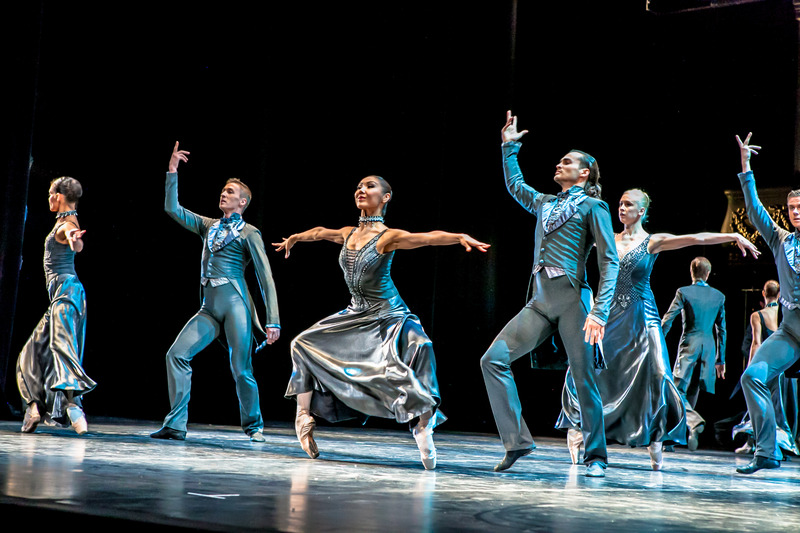 Lorina Gore brought a playful and elegantly physical touch to Oscar the page, the “trousers” role here configured to include distinctly feminine touches of high heels and a pretty blonde ponytail. Gore’s sparkling tone further enhanced Oscar’s already gorgeous music. Richard Anderson and David Parkin brought great presence to the pair of bass roles Count Ribbing and Count Horn, their vocal power adding significantly to the ominous nature of these duplicitous characters. Only Mariana Pentchava, as fortune teller Ulrica, gave a less than satisfactory rendition of her orle, a situation perhaps not helped by the fact that her costume and wig made her appear to be in a different production of the opera to everyone else (a traditional production). The chorus assembled for this production was almost as large as that for an arena spectacular. Chorus Master Michael Black did a reliably excellent job with their preparation. Andrea Molino led Orchestra Victoria in a strong performance of the demanding score. A Masked Ball continues at State Theatre, the Arts Centre until 3 May 2013. This review written for Theatre People 18 April 2013. My review – musically excellent, visually a disaster. 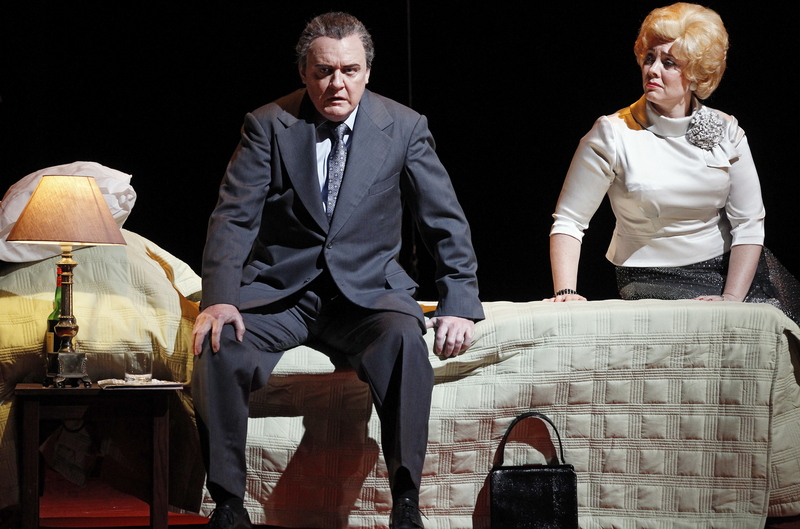 This production does nothing for the opera cause. I hope they have not destroyed AIDA as I going next Saturday. Thanks for your comments Jim. It is certainly a worry when you think about how much money would have been spent on a new production like this. An even bigger related worry for me is the fact that La Fura del Baus are doing next year’s Handa Opera on Sydney Harbour. Hope the final image does not involve quite as many dead bodies. Meanwhile, I think we are in much safer hands with Aida given that Graeme Murphy is at the helm. I agree Jane. I think it could have actually been quite good with the interesting set but not the masks. 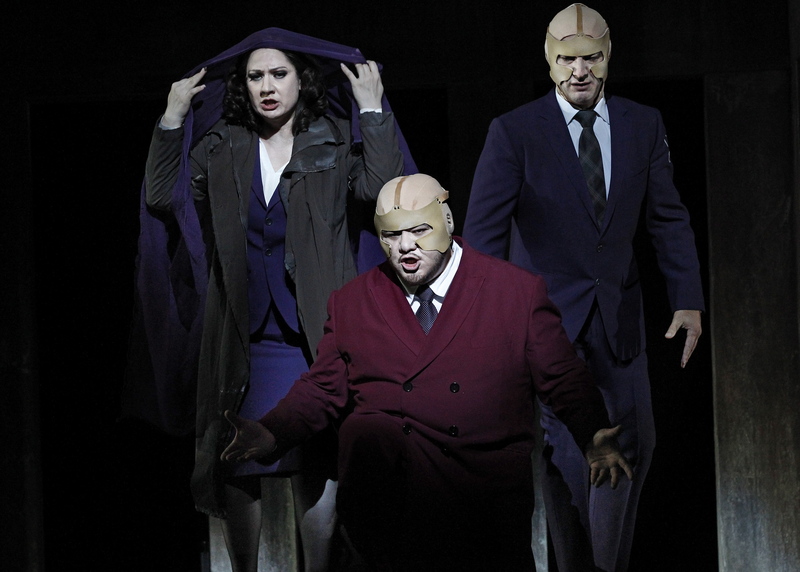 I really wonder what all the singers must have thought when they first saw the masks they had to wear. Given the size of the Opera on Sydney Harbour, I really hope they (La Fura del Baus) take more care in presenting Madama Butterfly on the Harbour next year so that the audience can distinguish the characters and singers!